Amplicon is supplying robus Modbus TCP I/O expansion units for data acquisition in harsh industrial process applications. 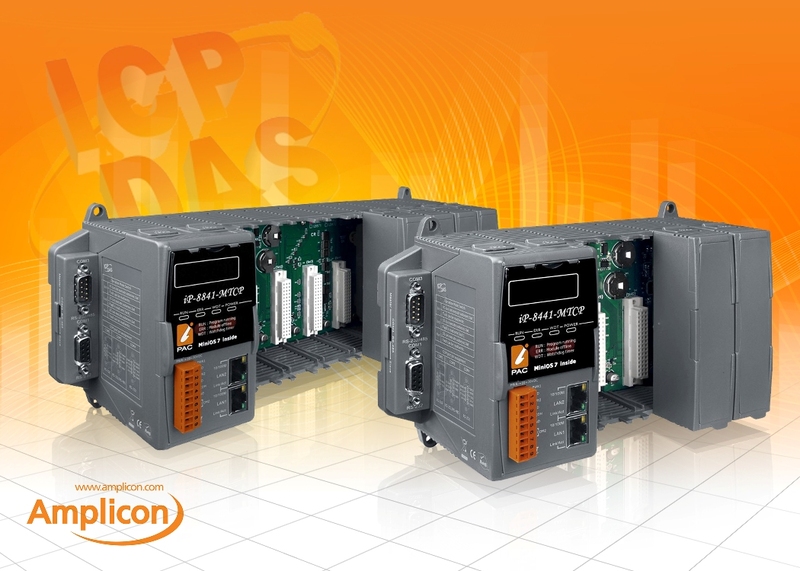 Amplicon has introduced the new ICP DAS iP-8000-MTCP series to its portfolio of measurement and control products, cost-effective Modbus TCP I/O expansion units to provide users with maximum flexibility when designing a custom data acquisition system that requires the measurement and control of a large number of process signals over an Ethernet network. The iP-8841-MTCP and iP-8441-MTCP have been specifically designed to withstand harsh and noisy environments; its wide input range (10 – 30VDC) and wide operating temperature (-25’C – 75’C) makes them perfectly suited for industrial monitoring and control applications such as building automation, process control and remote diagnosis and testing. The iP-8000-MTCP series from ICP DAS is compatible with the popular ICP DAS I-8K range of modules, with each unit boasting two Ethernet ports for dual LAN monitoring. With more than 50 I/O modules to choose from, including analogue and digital I/O, counter and frequency modules, the new series are the perfect choice when performing complex monitoring and control tasks. Features and benefits of the ICP DAS iP-8000-MTCP series include easy installation and maintenance, auto configuration, LED indicators for fault detection, dual watchdog, programmable power-on and safe values. Users will also receive great programmable freedom thanks to its DOS like OS (MiniOS7), giving engineers the ability to customise the firmware. An SDK is also included, which provides rich functions for Modbus communication, such as Modbus TCP master/slave, Modbus RTU master/salve and Modbus ASCII master/slave, etc.